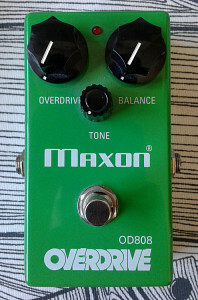 Maxon OD808 Overdrive. Reissue, made in japan around 2008. Another Tubescreamer? Well. Sort of. 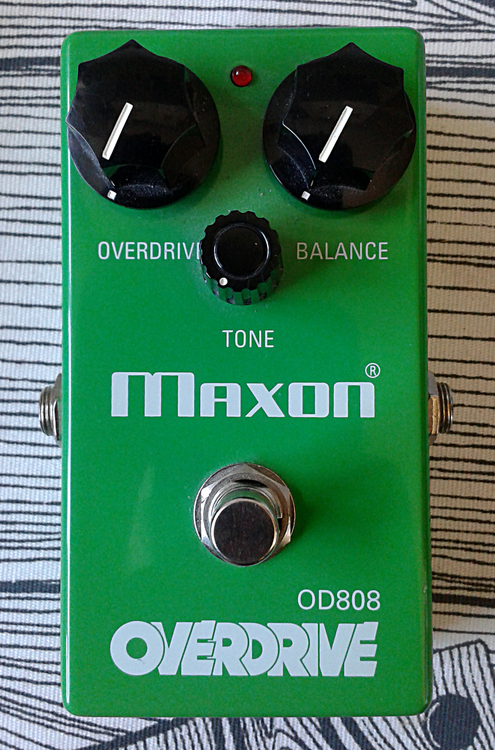 Apparently the design for Maxon OD808 has varied a lot over the years, depending on the “re-issue”. Some schematics available show the input and output buffers to be implemented with a LM1458 opamp instead of NPN transistors. This unit isn’t per that schematic due to only one dual opamp being used. So this unit is apparently the latter re-issue, which is pretty much 1:1 with Maxon designed Ibanez TS-808 Overdrive. From what i can tell, the board layout is not the same as in either original Maxon TS808 or Ibanez TS-808, but something different. 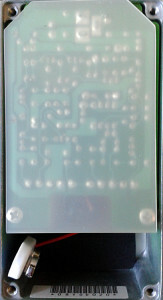 I do like the idea of fastening the board to the enclosure with several screws. This method should last a long time of careless (ab)use. 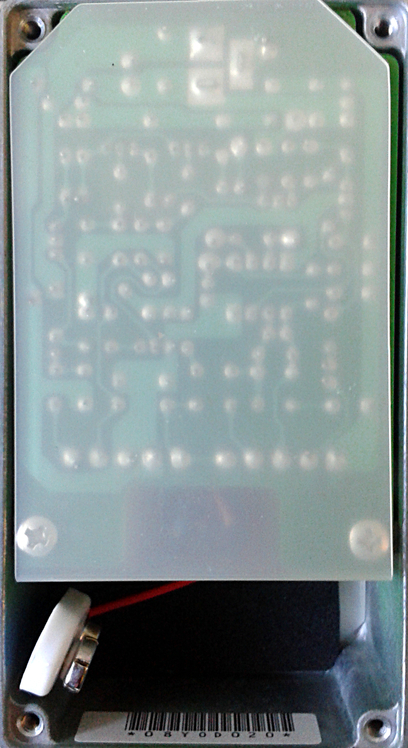 The component side is neat and laid out evenly, offering more smiles in terms of aesthetics. Even the plastic shell protecting the bottom of the box from touching the board is fastened with screws. Solid boxing design. 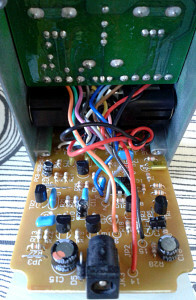 Controls are housed on their own board and much of the outboard wiring has been done without any sockets or other methods that reduce the labor. There’s a lot of hand craft for pedal that’s this modern. This is one great factor to consider, when you’re after a TS variant for your board and you’re confused about the pricing. Well made as every other Maxon box. And since the design is 1:1 with Ibanez TS-808, this is the closest you’ll get of having a brand new Ibanez TS-808. As for the hand drawn schematic (link above), the schem is exactly the same as TS-808 in all the component values. Only thing that differs is the electronic switching. 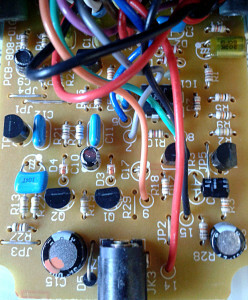 This unit doesn’t have the standard Ibanez flip-flop switching, but electronic equivalent based on a latching switch and a buffered bypass. Which is better, you might ask? Well. They are different. If you do have a strong opinion about which is better, i suggest you leave a comment with your justification for the choice. No. Really. I want to hear it. Surprisingly bright and open. Which makes me suspicious. Every single time i can hear a difference between two same circuits i’m puzzled. In terms of electronics theory this pedal should sound more or less like my 00’s TS9 reissue. But it doesn’t. Differences are subtle, but still noticeable. For the mid honk, that always makes me feel bad for the humble TS9, this one has it, but it isn’t as muffled as in, well, all the other reissues and derivatives out there. I’m forced to admit that this simply sounds better than most TS clones/derivatives i’ve played with. Why? I wish i could tell you why. If the original TS-808s sounded like this when they came out of the factory back in 1980, i sure am getting the cult reputation. Which was a deep mystery to me before this landed on my desk. It is a Tubescreamer. No denying that. But it is simply better than most other TS’s. The different switching could explain some of this, but it shouldn’t. Puzzling. Nevertheless. This is very good sounding Tubescreamer. If not the best i’ve played with, then its sitting in tight with the others in top three. Entries (RSS) and Comments (RSS). 34 queries in 0.108 seconds.